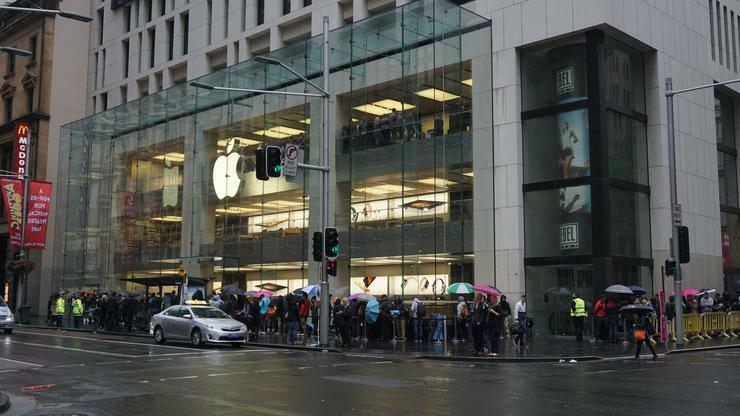 Sales for Apple’s iPhone 6s series kicked off this morning as Sydneysiders fared harsh weather to be among the first in the world to own the latest iPhone. Apple loyalists braved the night’s rain and temperatures that dipped to a cold 11 degrees. Eventually umbrellas rested against the shop front as the poor weather turned and an end to a long wait neared. Apple staff stood pressed against the glass facade, counting down from ten, as the 8am on sales time elapsed. The turn in weather was a welcomed relief for the first person in queue, Lindsay Handmer, who set up camp following the iPhone 6s’ global unveiling two weeks ago. Handmer led a line that wrapped around the Pitt Street store corner and spilled across the next two blocks, breaking only for roads and driveways. Fewer lined up this year, perhaps due to the rain or the incremental upgrade promised by the 6s moniker. Those that lined up grew in excitement as hired security chaperoned them into the store one group at a time. Apple Geniuses, hooded in ponchos, greeted new additions to the line with a smile and a handshake. Apple’s Pitt Street store was not the only shop front that opened to a line of waiting customers. The Vodafone, Telstra and Optus stores lining the same street each had queues of their own. Large red recliners sat on the curb outside of Vodafone’s flagship store, while Telstra’s promotion for the launch involved NRL players from five different teams. Anticipation for the iPhone 6s and 6s Plus has been building since the smartphones were unveiled at a San Francisco launch event on 11 September. Pre-sales opened to the public one week later to strong demand. A number of carriers exhausted pre-sale stock, leaving customers waiting up to ten weeks for select iPhone models. Among the most popular are 64GB versions of the 6s and 6s Plus in Rose Gold. Carriers have been able to exhaust pre-sale stock in spite of a weakened Australian dollar leading a rise in postpaid and outright pricing. Outright pricing has increased by approximately 20 per cent with the cheapest iPhone 6s (16GB) retailing for $1079. The 128GB variant retails for $1379. This model’s headlining feature is an innovation called 3D Touch. The display is pressure sensitive and uses the gesture to access the functionality of one app within another app. Click on a street address in the browser, for instance, and the iPhone will populate navigation instructions in Apple’s Maps app. Other improvements to this year’s iPhone include higher resolution cameras and the use of 7000 series aluminium. Stay tuned for our upcoming review of the iPhone 6s and 6s Plus.